Armani Privé Éclat de Jasmin begins like a demure, soapy floral (reminiscent of AnaisAnais) and then develops into a slightly powdery jasmine accentuated by rose. As hints of osmanthus peer through this almost-genuinely jasmine-y bouquet, it seems a bit promising, actually. Underneath, a fruitchouli base begins to develop, bringing to mind hints of the raspy Notorious (Ralph Lauren) and Allure Sensuelle - though not as sickeningly cloying as the latter. This is only how it plays in the first hour or two, after which point it turns into the jasmine-y version of Narciso Rodriguez' eponymous eau de toilette, i.e. : instead of the fake orange blossom in the latter you get little bit of jasminesque accents over plenty of musk. 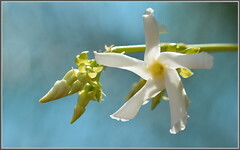 Not my favourite jasmine by any stretch, but if you like confusing florals, give this one a try.